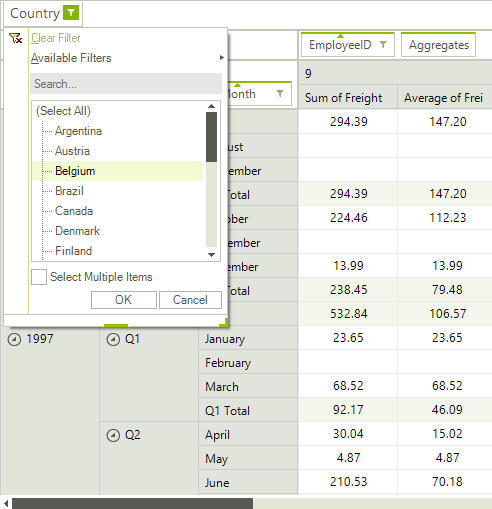 RadPivotGrid allows you to add filter conditions which describe which items from the data source should be included in the report. These filters are called Report Filters. Report filtering occurs before the aggregated information is calculated. This type of filtering is useful when you would like to see a report which concerns only records that share a common property, for example a sales report only for a specified country. The end-user can add/remove report filters by dragging a field to the report filters area or by using the RadPivotFieldList. Additionally, the filter menu opened by the filter button on the filter descriptor elements allows applying different filter conditions. This can be achieved by either selecting/deselecting items from the list box or by using one of the well-known filtering functions (Equals, Contains, Between, etc.). 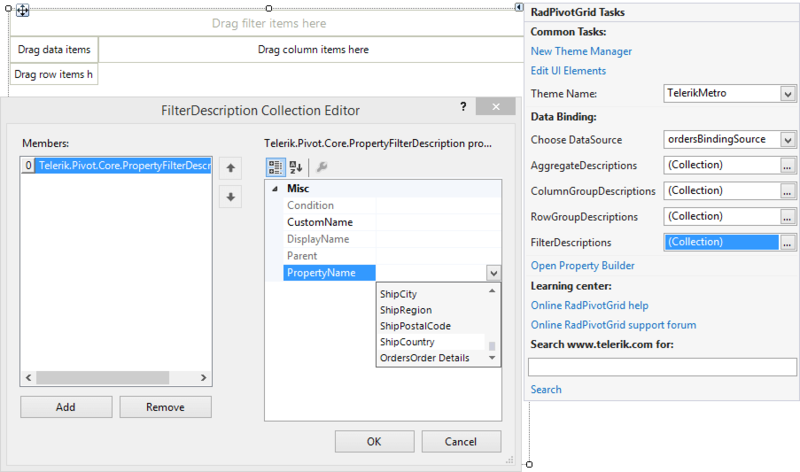 Report filter descriptions are stored in the FilterDescriptions collection of RadPivotGrid. You can edit the contents of the collection at design time, using the Smart tag of RadPivotGrid. The contents of the FilterDescriptions collection can also be edited at runtime using code. The FilterDescriptions collection consists of PropertyFilterDescription instances which specify the field on which a filter is applied.